Energy efficient house plans customized to your needs, affordably and quickly. save you BIG BUCKS in energy costs! With energy costs rising significantly, interest in energy efficient house plans has risen, too. But what exactly comprises an energy efficient home design? The most important factor in an energy efficient house plan is the "building envelope." This consists of a home's foundation, walls, roof, windows, and doors. The building envelope not only protects you and your family, but it also helps regulate the indoor environment, and controls the flow of energy between the home's interior and exterior.So your choice of walls, roof, windows, and doors is critical to having an energy efficient home. Much of an energy efficient home design depends on your goals and your budget. Some people want an ultra-energy efficient home that collects solar energy, uses geothermal heating and cooling, and other technologies--all of which add (sometimes significant) cost to building a home. Those technologies are great, and if you have the budget, we encourage you to learn more about them and invest in them. Our site contains lots of good information about these technologies. Other people are willing to sacrifice a "normal" looking home and build a dome or other house design that takes advantage of every bit of solar and interior energy. When choosing your appliances and lighting and plumbing fixtures, definitely look at the many options now available for energy efficient versions, too. Consider an on-demand water heater to greatly reduce the energy costs versus a typical hot water heater. Designers can customize the location of windows and walls to maximize solar gain in the winter. Then, for maximum cooling in the summer, energy efficient house plans can incorporate awnings, porches, and trees to shade windows and roofs. In addition, an energy efficient home designer can incorporate thoughtful window placement to provide more natural light during the day to reduce the need for electric lighting. For people in warm climates, energy efficient house plans can adjust the amount of overhang on your roof and soffit. This simple design technique can greatly minimize the daytime heating by the sun, yet not obstruct the pleasant light that the sun provides during the day. Click here for more information on passive solar house plans. Generally speaking, smaller homes are more energy efficient. They simply have less space to heat, cool, and light. Single-story homes will also provide more energy efficiency over two-story (or more) homes, especially in warmer climates. Heat rises! Learn more about small house plans here. Your choice of building materials can make a huge difference in the energy efficiency of your home. The walls of your home, in particular, form the critical barrier between you and the heat (or cold). Your walls' ability to insulate your interior air from the temperature of the air outside is the single biggest factor in how energy efficient your home is. That's why we highly recommend insulating concrete forms (ICF) to build your exterior walls. The ICF building method has been around for a long time, and is gaining in popularity in these times of high energy costs. Depending on where you live, ICF may cost more to build (typically 1% to 8% more than "stick" building)...however, it may sometimes even cost less than stick building. It definitely pays to shop around when looking for a builder, and get several quotes from experienced ICF builders as well as stick builders. ICF homes can reduce your heating and cooling bills by 50%. Another added benefit is their resistance to severe weather and fire, which explains why homeowners insurance rates can also be up to 50% cheaper for ICF homes versus stick-built homes. 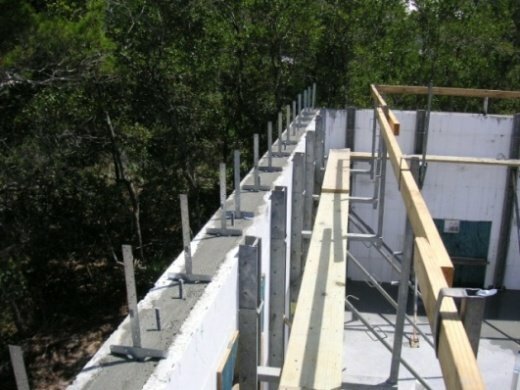 Energy efficient house plans that use ICF need to reflect the walls' increased thickness over 2x4 or 2x6 wood walls. The photo below shows an ICF home during construction. The foam remains in place, creating a very energy efficient wall structure. All plumbing and electrical work can be placed within ICF walls, just like in traditional wood walls. And the interior walls of the home can be built using traditional 2x4 or 2x6s, or they can also be built using the ICF blocks. Learn more about ICF homes here. Contact one of the architects or builders in our directory about creating an energy efficient house plan for you. Return to the House Plans Catalog page from Energy Efficient House Plans. Return from Energy Efficient House Plans to the Home Page.